Concise Encyclopedia of Real Estate Business Terms puts the terms used every day in the marketing and study of real estate at your fingertips. With a simple A-to-Z format, this comprehensive reference guide gets right to the point, providing brief but clear definitions and understandable explanations for more than 300 current terms and concepts used in every aspect of the real estate industry. An essential communication tool for anyone working in real estate management, insurance, economics, and urban planning, this practical guide is equally valuable for libraries, academics, and students. 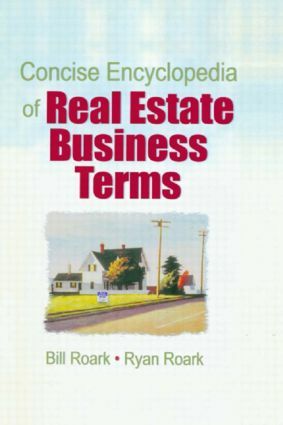 Compiled by Bill and Ryan Roark, realtors and co-hosts of Taking Care of Business, a live weekly real estate news and information talk radio program, the Concise Encyclopedia of Real Estate Business Terms provides quick and easy access to the terminology that’s unique to the real estate industry. From A (AAA Tenant, absorption rate, abstract) to Z (zoning) and everything in between, this handy reference resource will ensure you’re not at a loss for words when dealing with the legal and financial issues related to real estate and property. The book also includes an appendix of sample forms and contracts and another that covers measurements and conversions. The Concise Encyclopedia of Real Estate Business Terms is equally valuable as a professional reference guide and as a classroom and library resource.